That's a bummer, but not completely surprising. Very tough record to break for numerous reasons. Makes you respect the guys that do it solo that much more. Gonna need a bigger boat. And spare foils. 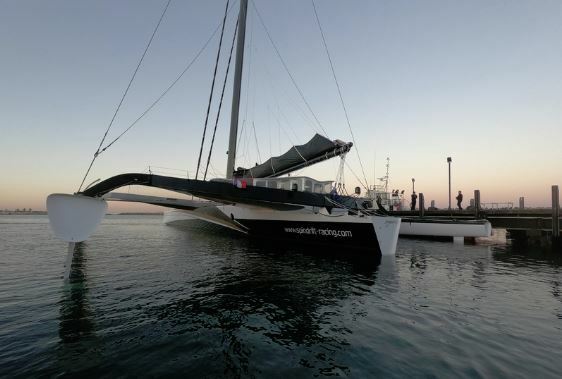 After spending five days nursing the boat back to land with the constant worry as to the viability of the damaged rudder, the black and gold trimaran is now safely docked in Fremantle (near Perth, Western Australia) and, after much consideration, the team has decided that the quickest and best solution to repatriate Spindrift 2 back to its home port in Brittany, will be by cargo ship. "We will remove the rudder and organise the boat in readiness for the cargo ship. We also have a concern over the port rudder, so it could be complicated to get back to our base [in Brittany, France] by sea, especially as we are on the other side of the world. The whole crew, and an additional five from our technical team, will focus attention on preparing the boat for the return trip. 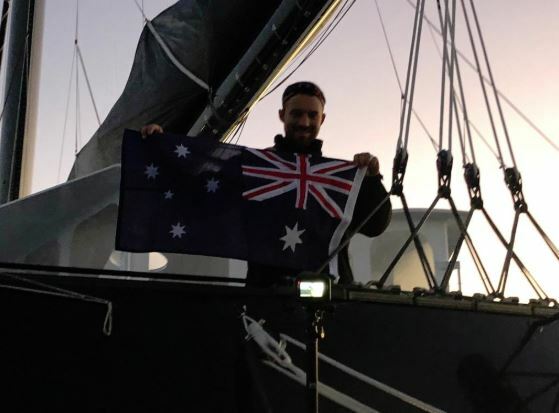 We will have to remove the mast and ensure that she is fully ready for the journey," commented Yann Guichard a few hours after arriving in the Australian port. "The starboard rudder stock broke shortly after the Kerguelen Islands. We do not know when exactly, but Thierry Chabagny was helming, said it suddenly felt very heavy. I am positive that we didn't hit anything. We were on port tack heading east-northeast with the downwind gennaker. As it happened at night we tried to establish what the issue might be - whether the rudders were parallel, the tension of the steering cables, or just something stuck on the rudders. But nothing. When we changed helmsman, it was exactly the same - difficult to round up or bear away. It was becoming even more difficult to steer as the boat was doing what it wanted. At first light we were able to see that the starboard rudder stock had broken between the two bearings. The rudder was useless and kept moving sideways - it just did what it wanted," continued the skipper of Spindrift 2. 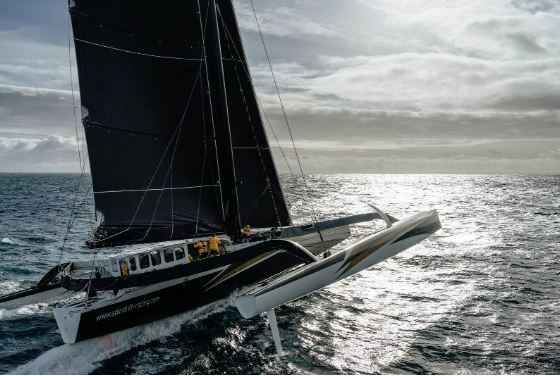 There is a huge feeling of disappointment as the black and gold trimaran was matching the Jules Verne Trophy record, with a favourable forecast ahead for the Pacific and Cape Horn so Yann Guichard and his eleven crew now want to understand exactly why it happened. 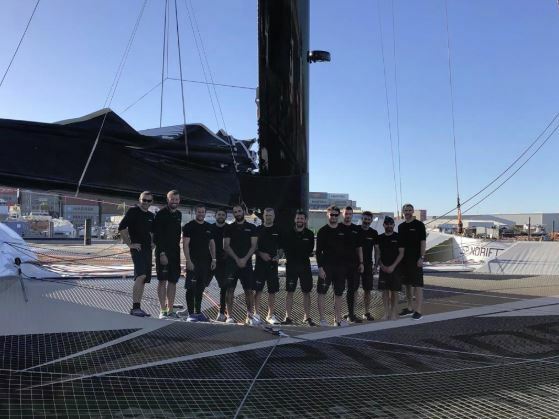 "We will analyse everything, but I cannot pretend that both the crew and I are extremely disappointed: we were well placed within the record time, and with very favourable conditions to come. After our dismasting a year ago, this is the second time that equipment has let us down! But we were lucky not to have lost the rudder, as that could have ripped out the bottom of the hull. So we will be able to establish if it is a manufacturing defect or an error in the structural calculation. We made the journey to the Kerguelen mainly on port tack, but we never pushed the boat more than necessary in the very strong winds. Spindrift 2 goes much faster now than she did three years ago on our first attempt. This time we had all the aces in our hand, although weather conditions in the Indian Ocean were not as favourable as they were for IDEC Sport. It's really frustrating knowing that we didn't hit anything, nor did we do anything wrong." The weather window at the start of the Trophy attempt was on the team's side they broke the record between Ushant and the Equator (4d 19h 57'). They exploited the potential of Spindrift 2 in this first section of the course, ensuring that they got around the Saint Helena anticyclone, reached the longitude of the Cape of Good Hope, and then passed beneath the Kerguelen Islands, despite the presence of icebergs. When the rudder broke, the crew were still tens of miles ahead of the record time. "At least we showed that we could go fast, as we have the record between Ushant and the Equator - although we needed to do eight or nine gybes, compared to only the one three years ago! The combination of a smaller mast and new foils meant that the hulls are in the water less so, with less drag, we go faster. And the team was amazing - there was an incredible chemistry between the twelve of us. It was the right number and everyone quickly got into their roles. The changes that we made to the deck roof were also really good, and protected us from the wind and cold. We went to almost 55° South with water at 2° C - a slalom amongst the ice! " But before considering a new attempt and adjusting the team's sailing programme, Yann Guichard wants time to analyse and fully understand why the rudder stock broke with no warning. "For the moment, our focus is on understanding why the rudder broke: aside from cost, there is also the delay in building a new rudder and the simple fact that boatyards are very busy at this time of year. If we have to build a new one [rudder], then that will take time. So, it is still too early to know what we are going to do. First we will meet with our stakeholders and look at all the facts and then we will then take time to consider whether we continue with the Jules Verne Trophy programme next winter, or not." Big loads and feather weight composites would be my guess. When pushing the edge, sometimes you step over it. Aluminum stock a better choice?